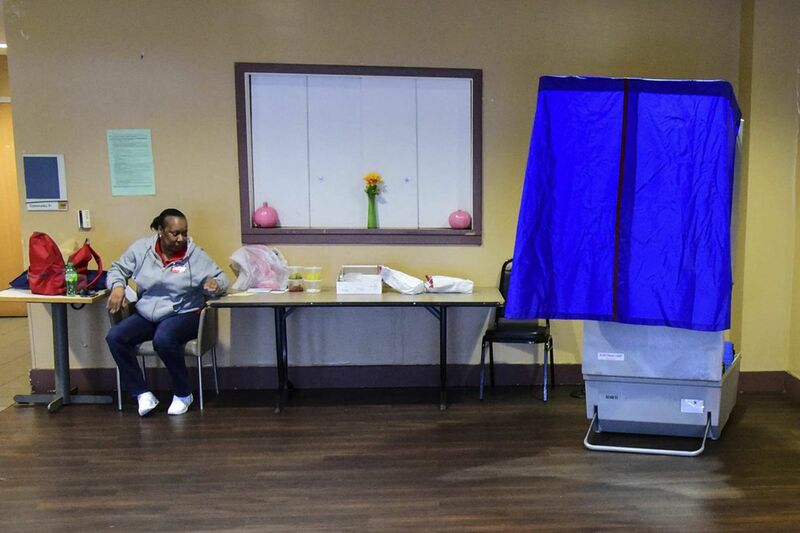 A polling place in Chester city, Delaware County, on Tuesday. Pennsylvania voters approved a constitutional amendment that could lead to an overhaul of the state’s property tax system. But a majority of voters in Philadelphia and its surrounding counties voted against the measure. The constitutional amendment on property taxes approved by Pennsylvania voters will have no immediate impact for homeowners — and it's possible nothing will change at all. But one thing is certain: The results of Tuesday's referendum will energize grassroots groups and some state lawmakers to redouble their efforts to overhaul or eliminate property taxes. "Anytime you amend the constitution to allow for something different it's a big deal, and there's certainly a lot of noise and a lot of local push for something on relief of property taxes," said Gerry Cross, executive director of the nonpartisan Pennsylvania Economy League. "But the devil's in the details. No one knows what the legislature will come up with, and that's always been a chronic problem of trying to satisfy the different regions of the state." The amendment approved permits legislation that could exempt homeowners from paying property taxes. If it passed, taxing authorities — counties, school districts, and municipalities — could choose to exempt taxes for up to 100 percent of the assessed value for primary residences. Yet that is unlikely to happen unless other sources of revenue become available to replace property taxes, which are key to local and school government budgets. Those sources could include higher income tax and sales tax, and would also require more legislation. State Sen. David Argall (R., Schuylkill), said Wednesday that he plans to hold a meeting with the grassroots groups that have long been pushing for property tax elimination. Argall is the sponsor of a bill that would eliminate the school levy, which makes up the largest share of property tax bills. In exchange, his bill would raise sales and income taxes and offer a formula for distributing that money to school districts. His bill, which was voted down when Lt. Gov. Mike Stack broke a tie in the state Senate in 2015, was unrelated to this week's ballot question. But Argall said he is hopeful that it will give him more options and more votes from fellow senators. Grassroots supporters of property tax elimination will help him come up with new options to present to lawmakers, he said. "We're going to sit down with every single senator and say, 'which of these can you support?'" Argall said. "And whichever option has the most votes, that's the one that we will run on the floor." Argall admitted he will have trouble gaining support from lawmakers in Southeastern Pennsylvania, where a majority of voters rejected the constitutional amendment. Statewide, the ballot question passed by a margin of nearly 140,000 votes. But in Philadelphia and its surrounding counties — Bucks, Chester, Delaware, and Montgomery — voters rejected the measure by a margin of 94,000 votes. A majority of voters in Allegheny and Centre counties also rejected the amendment, as did a cluster of counties in the Northwest part of the state: Mercer, Crawford, Venango, and Clarion. In each of the state's 56 other counties, a majority of voters approved the constitutional amendment. "You will see a great variation in the results," Argall said. "And that's of course been one of the difficulties in moving this issue forward." And even though Tuesday's results opened the door to dramatic changes in the state's tax system, the results captured only the opinions of a small fraction of Pennsylvanians. The state has 8 million registered voters; 1.7 million of them cast votes on the constitutional amendment. Lawmakers from both parties have said they are open to eliminating property taxes, including Gov. Wolf. "Governor Wolf has long-supported property tax relief and has left the door open to elimination if done in a responsible, fair way, such as not taxing food or clothing," his spokesman, J.J. Abbott wrote in an email Wednesday in response to the ballot question's success. "Now there must be legislative action to address this issue." Wolf has said he does not support Argall's bill, known as the Property Tax Independence Act, which would tax clothing and some foods. Abbott also said federal tax reform, which could eliminate deductions for state and local income and sales taxes, would affect plans at the state level. So how could the state make it possible to eliminate or reduce real estate levies? The state's Independent Fiscal Office examined in a May presentation various proposals to reform or eliminate the school property taxes that have gone before the legislature. All of them rely to some extent on raising income and sales taxes, the office found. Raise the personal income tax from 3.07 percent to 4.95 percent. Reduce school property taxes over time by raising the sales tax from 6 percent to 7 percent and raising the personal income tax to 3.7 percent. Allow school boards to reduce or eliminate taxes by raising local earned income or business taxes. Argall's Property Tax Independence Act would eliminate new school property taxes, but keep taxes in place until existing school district debt is paid off. The personal income tax would increase to 4.34 percent, and the sales tax would increase to 7 percent. Sales taxes would expand to include clothing and certain foods. Every option would have winners and losers, the fiscal office found. Faster-growing school districts could experience declines in revenue they receive per district, while districts that are declining in size could see increases in per-student revenue, because some of the proposed funding formulas do not adjust for school districts' changing sizes. Home prices could increase and rent could decrease without a property tax, the fiscal office said, but that would vary widely across the state and would depend on local markets. School officials have also spoken out against some of the options for eliminating school property taxes, as it would involve giving up local control over funding. Under most proposed plans, school boards would give up the ability to levy new taxes and would rely instead on revenue distributed through the state. The constitutional amendment approved this week could also apply to property taxes imposed by counties and municipalities. "It's going to be real hard for them to agree on replacement revenue without considering the problems of counties and municipalities, also," said Cross, of the Economy League. "They also are dependent on property tax revenue. … That's a real hurdle for the legislature to overcome."